One of the many reasons I love blogging so much is because I meet so many amazing and generous readers. I have had the pleasure lately in getting to know Elizabeth, mom to 17 month old Robert, and owner of the Etsy Shop JCOMPANY. 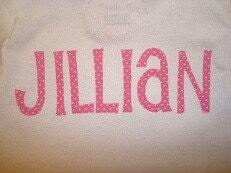 Elizabeth creates South Carolina symbol onesies and I absolutely had to get one for Jillian!!! Elizabeth created a beautiful pink South Carolina symbol onesie for Jillian and I would also love for one of my readers to win one of Elizabeth's adorable onesies too! Elizabeth has graciously offered my readers a South Carolina symbol onesie (Size 6-9 month) for the little one in your life!!!! Leave me a comment and tell me about the beautiful baby that you would love to have wear this adorable onesie. 1. Go to Elizabeth's Etsy Shop,and leave me a comment to let me know what other products you would love to have for the little one in your life. 2. For a second entry, leave a separate comment letting me know you have become a follower of our blog or that you are already following our blog. 3. For a third entry, become a follower of Elizabeth's JCOMPANY BLOG. 4. For a fourth entry, follow me on Twitter - Click on the Twitter icon on the right hand side of my blog. Leave me a comment letting me know that you are now following me on Twitter. 5. For a fifth entry, leave a separate comment letting me know you blogged about the giveaway. Please make sure to leave the link to your blog post or the entry will not be accepted. 6. For a sixth entry, Grab My Blog Button and post it to your blog!!! Please leave me a comment so I can find your button. 7. For a seventh entry, Click on the Top Mommy Blogs Button on the left hand side of my blog and leave me a comment that you voted. For each entry, leave a separate comment - & don't forget to leave your email address! This Giveaway ends Friday, September 5 at 10pmEST. A winner will be drawn by Random.org and posted on Saturday, September 6th (open to US Residents Only). As always, thank you for your continued support. And a BIG thank you to Elizabeth from JCompany for sponsoring this great giveaway!!! Please check our her adorable shop! Hi Karen, My name's Shaun and I saw your post on TB. I have a 3 month old named Paige who is the light of my life. She's starting to learn how to roll over and grab at stuff. She always stares at the palm tree picture that's over her crib too! I love the baseball tie onesie in J Company's shop. I love the little onesie with the baseball tie! Would be perfect for my little man next spring during baseball season! I have been a follower of your blog for some time now! I love reading the adventures of a working mom! I also added your button to my blog! I love the giraffe onesie! Since we're about to start TTC again, I would get a little NC onesie for my future babe! Oh my gosh...so many things on J Company etsy! I think the little guitar onesie would be great for any of my friends little ones! I voted for you on Top Mommy Blogs. You can contact me through replying to this comment...I don't like to post my email! Oh I love her pink giraffe onesie! I just voted for you on TMB!! Following from Relax and Surf...would love to have you follow back! Hey Karen & Jillian!! Unfortunately my little Wilson is in 18 month clothing already, however I have a dear friend who has an almost 4 month old -- their first child -- that I would like to give this to. Her husband is our new Associate Minister at our church. AND you know I'm a SC girl! Thanks for this great giveaway! Just voted for you on Top Mommy Blogs, as I try to most days! I am a follower of your bog. I am your newest follower via the Relax and Surf Blog Hop. Please come by anytime you get a moment and visit me too. south carolina onesie, for sure! i'm a sc girl! The monogram onesie with flowers at jcompany's shop is adorable!!!! I voted for you at top mommy blogs!! I'd love one for my own Gillian. Gillian Grace would be so cute in something from her store just like your sweet girl! I am following her blog too! I have your button on my blog roll. Thanks for sponsoring the giveaway, Karen! My daughter (or maybe a future child) would love to have a onesie like this. It would be perfect for pictures! Her hot pink butterfly clip is PRECIOUS!